You are probably wondering why on earth I am listing a recipe for something that does not really need a recipe? I usually go to gym in the afternoon and on my way home I snack on a selection of nuts, seeds and dried fruit. For the past year I have been buying these little packs and frankly I am not sure why I have spent so much money on eating a store bought snack that I could easily make at home. 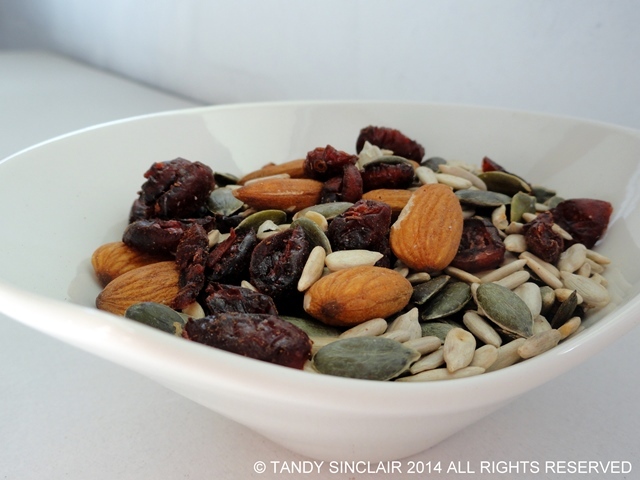 I am sharing the recipe for trail mix in case you too have never thought to make this at home. This trial mix has a selection of the nuts, seeds and dried cranberries that I like but you can use what you prefer. I also used these as a filling for my weekly rusk recipe, which I will be sharing with you soon. Do you eat store bought snacks? I have a small tuperware box of trail mix that travels everywhere with me – perfect for days in London when invariably I’m running between meetings and trying hard to avoid eating yucky shop bought sandwiches! I also add the mix to my granola. A great idea for a post Tandy! We enjoy a good trail mix as well and you are right there is nothing better than home made. Great recipe and the cinnamon in the mix sounds so good, Tandy! You can’t beat the convenience of pre-packaged, single serving trail mix, but it really is such a waste of money. Great idea to make it yourself. I make homemade granola bars almost every Sunday for our weekly snack/breakfast, but we do love trail mixes, too — especially when we go hiking. I love nuts and dried fruit, sadly they don’t like me! I don’t eat trail mixes as I prefer to save my calories for really bad stuff, (cake, pork belly etc) Even writing that I feel guilty! Hubby is the healthy one and he loves snacking on these so I will have to make this mix up for him. I love the fact you added some cinnamon!! YUM! Love your addition of pumpkin seeds! I love packing some trail mix always to be in my bag, makes a afternoon snack much easier and cheaper than stopping for a snack while out! I don’t have an off switch when eating things like this. I just keeping popping more in my mouth! Have a super evening Tandy. When I stop and think about it, when it comes to snacks I do purchase them instead of make them myself, never really realized that before. Will have to change this right away. Thanks for the eye opening Tandy! great recipe. I like the idea of adding cinnamon to the mix.